The use of chemical peels to soften and improve the appearance of the skin, dates back to the ancient Egyptians. Little did they know that they were benefiting from the superficial skin peeling effects of hydroxy acids; lactic acid in the milk they were bathing in and tartaric acid in the grape skins they rubbed on their skin. Today, scientists have identified numerous forms of acid which can be used to induce beneficial changes for our skin, including salicylic acid, trichloroacetic acid (TCA) and phenol. Chemical peeling (chemexfoliation) involves the application of a chemical solution to the surface of the skin to produce the careful removal of its outer layers. The amount of skin removed will depend on the type of chemical used, the strength of the product (superficial, medium depth and deep) and how long it is left on the skin. They can be used on most areas of the body, but are commonly used on the face or the backs of the hands to improve rough skin texture, fine lines and wrinkles, age spots, sun damage, blemishes, scars or acne and actinic keratosis (precancerous skin growth). Private costs for chemical peels depend upon the type of peel and problem being treated. Using the Compositum peel range can visibly diminishes the look of fine lines and wrinkles, and areas of hyperpigmentation. It can also be used to improve the appearance of acne scars. CosMedix™ Peels use a process called ‘chiral correction’, making the majority of the active ingredients that they use less irritating. Developed in the US, by leading dermatologist, Dr Carl Thornfeldt, the Epionce Peels are formulated for all skin types. Epionce skin peels use a combination of malic and salicylic acids, along with botanical extracts which have anti-bacterial and anti-inflammatory properties. Green Peel®, created by Christine Schrammeck in the early 80s in Germany is a superficial green herbal peel treatment consisting of a blend of natural (unspecified) herbs. Using the Jan Marini regimen, glycolic acid - derived from cane sugar, you'll see healthier, younger-looking skin. It visibly diminishes the look of fine lines and wrinkles. Launched in the UK in September 2005, Mandel are a unique range of peeling products containing the natural ingredient mandelic acid (derived from bitter almonds). Using an MD Forte ® regimen, glycolic acid - derived from cane sugar, you'll see healthier, younger-looking skin. It visibly diminishes the look of fine lines and wrinkles. The Perfect Peel is founded on a key anti-ageing ingredient never before used in a chemical peel: Glutathione. It can be used on all skin types and requires no pre-peel skin preparation. The Theraderm Peel is a superficial Jessner's solution chemical peel comprised of resorcinol, lactic acid, and salicylic acid. The use of chemical peels to soften and improve the appearance of the skin dates back over 3,500 years to the ancient Egyptians. Historians describe the use of several different techniques, including the use of animal oils, salt, and alabaster to smooth the skin. Egyptian women bathed in sour milk, or rubbed fermented grape skins from the bottom of wine barrels over their skin to enhance beauty. Little did they know that they were benefiting from the superficial skin peeling effects of a family of chemicals called hydroxy acids which remove the outer layers of the skin. These acids have now been identified as lactic acid in milk and tartaric acid in grape skins and can be found in a huge number of modern beauty products. Later in history, poultices (something like our modern face packs) containing mustard, sulphur, and limestone were used for similar purposes. Indian women mixed urine with pumice and Turkish women singed their skin with fire to create an early form of exfoliation or removal of the outer, rough surface of the skin. Today, scientists have identified numerous forms of acid which can be used to induce beneficial changes for our skin, including salicylic acid, trichloroacetic acid (or T.C.A.) and phenol peels. Facial peels have grown enormously in popularity over the past twenty-five years and now it can be a very effective treatment when performed by an experienced practitioner. Such is their success rate that chemical peels are now the 5th commonest cosmetic procedure in the U.S.A.. Official statistics from the American Society for Aesthetic Plastic Surgery (ASAPS) reveal that 118 523 procedures were performed in 2017, an increase of 15.9% on 2016 figures. As yet, no similar reliable figures are available for the U.K., but there is evidence that treatments are growing very rapidly. More practitioners than ever before are seeking training in a constantly growing market of different kinds of chemical peels. If you are considering a chemical peel procedure, the following information will give you a basic understanding of the process. It can't answer all your questions, since a lot depends on the individual patient and the practitioner. Please ask your practitioner about anything you don't understand. The procedure known as chemical peeling (or chemexfoliation to give it its proper name) involves the application of a chemical solution to the surface of the skin to produce the careful removal of its outer layers. The amount of skin removed will depend on the type of chemical used, the strength of this product and how long it is left on the skin. 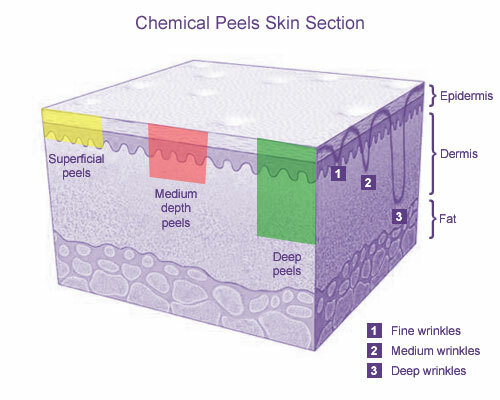 Look at the diagram below to see where the different layers are and where different types of peels act on the skin. Remove both the epidermal layers and upper dermal layers. These are the next layers down as you can see on the diagram. No matter how deep the peel, your skin will re-grow and should heal fully. If you choose to have a deeper peel – maybe to get rid of wrinkles or acne scars – when the skin re-grows, it will not “remember” the blemishes that were there before. As the new skin develops, a new band of collagen in the dermis will grow along with a thicker epidermis. Hence, your skin will appear smoother and more perfect than before the treatment. The deeper the peel, the greater potential for improvement to the skin. However, a minority of people can experience some side effects with deeper peels. Chemical peels can be used on most areas of the body, but the commonest use is to improve the appearance of sun damaged skin on the face, or the backs of the hands. They can also be used to improve certain skin spots, blemishes or lesions such as acne and actinic keratosis. If you are considering having a chemical peel, you must go to an experienced practitioner as the success of the treatment depends on a variety of factors. Your skin type and the problem which requires attention both need to be investigated fully by you and your practitioner. Below is a list of the treatments and the type of skin problems which they can reduce. Can help to reduce the appearance of deeper lines, wrinkles and scars. PLEASE BE AWARE: chemical peels cannot change your pore size, improve loose skin (saggy skin generally needs to be treated by surgery), or deal with deep scarring. What are the different types of peels used? All the terms and descriptions below are words which your practitioner may use when talking to you about your chemical peel, so it might be a good idea to read up on them now. However, don’t worry, if it all seems mind-bogglingly technical! You will be given good guidance about which product and treatment is best for you if you go to see an experienced practitioner in this area. HYPERPIGMENTATION: where the skin has too much pigment and that can lead to brownish spots or blotches on the skin. HYPOPIGMENTATION: the opposite of the above when the skin can look white or bleached. These are the commonest types of peel used and most often contain some form of hydroxy acid, which is a family of chemicals known to cause exfoliation (removing the top layer of dead skin cells in the epidermis), when applied to the surface of the skin. A superficial peel is like a mild “sandpapering” of the facial skin and it will give your face a healthy glow. You might want to have a peel prior to a special occasion when you want your face to look alive and glowing. Different forms of hydroxy acid are available on the market. These include alpha hydroxy acids, such as the naturally occurring lactic acid (sour milk) and tartaric acid (from grape skins). Salicylic acid, is a beta hydroxy acid and is unique amongst the hydroxy acids in that it can penetrate deeper into the oil glands causing exfoliation even in the oily areas of the face and scalp. For this reason it has been used for years by dermatologists (skin specialists) to help treat comedonal acne in people who have very oily skins. Glycolic acid : This product comes in different strengths (30% - 90%) and different pH levels (levels of acidity). Sometimes combinations of different hydroxy acids are used, such as Jessner's Solution which contains a combination of lactic acid and salicylic acid. MD Forte, Agera RX, Dermaceutic, Jan Marini, Theraderm Peel, ICP, Mene & Moy, Skinceuticals Gel Peels, Mandel, Cosmedix (Chirally Correct) and NeoStrata. Lower strength TCA (Trichloroacetic acid) may also be used to obtain a superficial peel. These involve the use of stronger peeling solutions. The commonest of these is higher strength T.C.A., Trichloroacetic acid which can be used on it’s own at up to 50% strength, but it is more commonly used in concentrations around 25% - 35% to help reduce possible side effects. T.C.A. can also be used in combination with glycolic acid or other solutions to help achieve a more controlled and even peel to the correct depth. These are generally performed using phenol, or 40% TCA. Although deeper peels can be very effective for the right patient, there are a number of potential complications associated with this procedure. Consequently, you will find fewer trained practitioners offering deep peels in the U.K. than those who can give you a medium or superficial treatment. At your first consultation with a practitioner, you should explain what you expect from the treatment and how you would like to look afterwards. He or she should tell you exactly what the treatment will involve and how long it will take for you to recover from it. A medical history should be taken by the practitioner, to ensure that there are no reasons why you shouldn’t have the treatment. Once this is established, you would normally be asked to read some detailed information and sign a consent form indicating that you have understood the potential benefits and risks associated with the peel procedure recommended. Depending on the depth of peel and combination of peels used, different treatment procedures are recommended. You would normally be asked to avoid any changes in your normal skincare routine 1 - 2 weeks prior to peel treatment. Things to avoid include electrolysis (facial hair removal), an exfoliating facial, sunbathing, tanning beds, or the use of any new creams as these could alter your response to the peeling agent. What happens next depends on the type of peel used. For one of the commonest peeling agents used, glycolic acid, the procedure is generally quick and easy to perform. The face is cleansed to strip the skin temporarily of its natural oils and allow the glycolic acid to be absorbed into the skin. The peel is then quickly painted onto the area to be treated and is left for between 2 - 10 minutes, depending upon the strength and type of glycolic peel used, before it is washed off and neutralised. This mild peel generally needs to be repeated weekly for 4-6 weeks to obtain a good result, which can then be maintained with monthly peels. The skin is again thoroughly cleansed before application of the peel. An even layer of the peeling agent is applied to the area to be treated, which makes the skin slowly becomes whitish – grey, or “frosted”. A fan is sometimes used to help cool the face. Once frosting has occurred, which may take several minutes, cool saline compresses (pads soaked in a salt water solution) may be applied to the face to neutralise the peel. This type of peel may be repeated monthly until the desired effect is achieved. Thereafter, maintenance peels every 6 – 12 months should keep your skin looking good. Phenol is a strong chemical which is why it produces such dramatic results. A local anaesthetic block may be used prior to a phenol peel, this “freezes” your face and ensures that you do not experience any pain during the treatment. The “freezing” is very similar to that used by the dentist when you go for a filling. You may also be given a sedative whilst undergoing a phenol peel. Continuous heart monitoring is also required as phenol has the potential to cause irregular heartbeats in some patients. The skin is thoroughly cleansed and phenol is applied to the area to be treated whereupon the skin immediately turns white or "frosted" in appearance. For full face phenol peels, half of the face is treated first (this usually takes around 30 minutes), with half the peel being removed before the other half is treated. For some areas of the face, the practitioner many apply two or three layers of waterproof tape after phenol has been applied. The tape helps to the peel to work more effectively, and is removed 48 hours later. In some cases petroleum jelly (Vaseline) is used instead of tape. Just one phenol peel treatment can produce dramatic improvement in patients with sun damaged skin. These effects can last for 10 years or more. How long will it take to recover from a Chemical Peel? In general, most patients can return immediately back to work after this procedure. This can take from a few days to a week or so depending on how well you heal, your age (older skin tends to heal less quickly) and any post-treatment complications. This can take several weeks depending on how well you heal and any post-treatment complications. What are the risks and potential complications from Chemical Peel treatment? As you can probably guess, the depth of peel relates directly to the pain experienced and number of side effects. During the procedure most patients experience a mild stinging sensation whilst the glycolic acid is on the face. The face is often pink after the solution is removed, and there may be a faintish white discoloration in some areas, or a blotchy appearance to the skin that usually fades within a couple of hours. Some patients do not experience any visible peeling off of the skin after treatment, but the treatment still has a beneficial effect, like a very good exfoliation. Side effects or risks of superficial peels can be hyperpigmentation (too much pigment which causes brown blotches on the skin) and a high factor sunscreen should be applied at all times to help reduce the potential for this problem. The face may swell shortly after the solution has been applied and turn pink, with some burning and stinging of the skin that can last for 30 minutes to an hour following 25% - 35% TCA peels. Over the next few days, the face may turn a dark brown colour, with streaks of white appearing amongst the brown. The skin will then begin to peel, over a 5 - 6 day period, and may begin to itch during this healing phase. After peeling, the face will be bright red – this will fade to a fresh pink tone in most people over the following 3 - 6 weeks. Hyperpigmentation or brown spots may occur, even if you follow your doctor’s advice and apply sunscreen before going outdoors. Bleaching creams may be used to help reduce the appearance of these brown areas. Your practitioner will be able to recommend one which is suitable for you. Redness of the face may also last for longer than 2 - 3 months in some patients; however, this should disappear over time. Very rarely, some patients may develop scarring following a medium depth peel. This can occasionally be permanent, but you should be aware that such a result is extremely unlikely. Patients often feel unwell for several hours after this procedure. Pain can be moderate to severe for several days but is usually controlled with pain-killing tablets. You would normally need to be driven home following this procedure and only soft and liquid food can be eaten for a few days as chewing can be painful after the peel and it is a good idea not to disturb the face’s skin with vigorous chewing. The swelling of the face is usually at its worse at around 2 days after the procedure, but this will reduce over the following week. Itching can be a problem during the healing process, which may take up to 14 days before you are presentable in public with make up and a concealer to cover the remaining signs of the treatment. Redness may take 3 - 4 months to disappear, although it may last longer in some patients. Milia (small raised cysts or white spots on the face) usually occur during the first 6 - 8 weeks after peeling, and may last from a few days to many weeks. Permanent hypopigmentation is the commonest problem associated with deep phenol peels, but it is not common after this treatment. This is a permanent state and it is important to consider this before you have a deep peel if sensitive and particularly obvious areas of the face (such as the mouth) are treated. In such areas, the loss of the pigment, and consequent whitening, of the skin can be very noticeable unless you have very fair skin. Some patients may also develop hyperpigmentation problems. Again, it is vitally important that the skin is not exposed to the sun without protection to help reduce the likelihood of this problem occurring. Sunscreen with a high protection factor is recommended whenever you go outside and it is important that you stick to a sensible level of protection whenever your face is exposed to the sun. Scarring can be relatively common immediately after phenol peels (especially if tape is used), and, on occasions, this can be permanent, but mostly, it will heal over time if you follow medical advice. What should you do after a Chemical Peel treatment? It is very important that you carefully follow the advice of your practitioner following a peel treatment to help to improve the benefit of the procedure and reduce the risk of complications or side effects. contacting your practitioner immediately if you notice any signs of infection or pigment changes. if itching is severe during the healing phase, antihistamines may be recommended to help stop this symptom. have darkly pigmented skin, or red hair with freckled skin. In such cases, you would generally be unsuitable for the deeper peels owing to the potential for skin bleaching. Afro-Caribbean or Asian skin is often not suited to facial peels because of the risk of bleaching the skin. This is particularly the case with the deeper peels where the top layers of skin are removed. It is vital if you have skin of a darker colour that you find a practitioner who is experienced in using facial peels and discuss with them all these issues before you embark on any treatment. It may be that your skin is simply not suited to anything deeper than mild exfoliation. In addition, patients will also require an assessment of their heart, kidney and liver functions before undertaking a phenol peel. Who can perform a Chemical Peel? Superficial peels such as lactic and glycolic acid can generally be used by all kinds of medically trained staff, including doctors and nurses, and in some cases manufacturers train beauticians to perform very superficial peels. Medium peels such as TCA tend to be used by doctors of all kinds from GPs to surgeons, but you should seek an experienced dermatologist (skin specialist) or plastic surgeon for a deep phenol peel. What is the average cost of Chemical Peels? It is highly unlikely that anyone considering a chemical peel would be able to access this free of charge on the National Health Service. Prices for private chemical peel procedures can range from £60 per treatment session for mild glycolic peels including lactic and glycolic acid, to around £500 upwards for a course of 4 TCA peels to over £2,000 for the deeper phenol peels depending upon the type and extent of the problem treated. Lactic acid, glycolic acid, TCA and phenol chemical peels have been widely used to treat a range of different skin problems. Superficial peels can really help to even out the colour and smoothness of your skin. The stronger and deeper peels can have a more dramatic effect on obvious wrinkles and skin pigment problems, but you need to find a practitioner who understands how to use these properly. In the hands of someone who is not experienced, such treatments will not be entirely successful and you may find yourself with some unfortunate side effects. 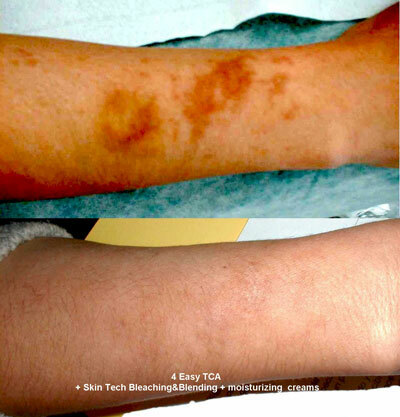 Photographs of hyperpigmentation on an arm (top picture) before and after 4 SkinTech Easy Peels and use of homecare products. Images provided courtesy of Euromedical Systems Limited. For more before and after images of chemical peel treatments, please see individual Product FAQs. Click for ALL Chemical Peels clinics in the UK & Ireland registered and verified by Consulting Room.